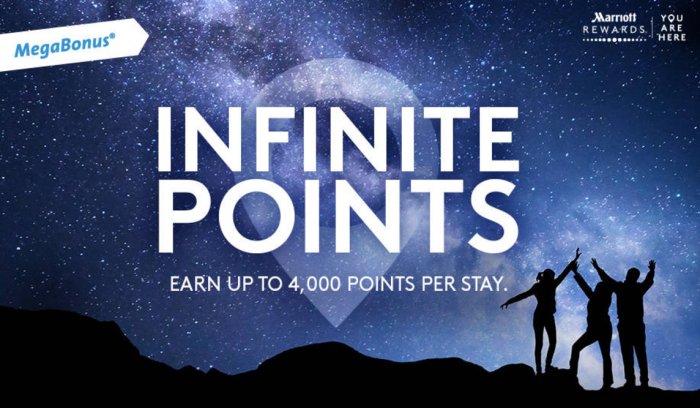 Marriott Rewards has launched their latest MegaBonus called “Infinite Points” that is valid for stays between May 27 – September 4, 2017. Registration for this offer closes on August 30th. Members earn 2,000 bonus points per stay and an additional 2,000 bonus points for each Marriott brand stayed at during the promotional period starting from the second stay/brand. You can thus earn up to 4,000 Marriott Rewards points per stay during the promotional period from the second stay onwards. You can register for this offer on Marriott Rewards website here. This is the first time the MegaBonus has brand component thrown in. MegaBonuses have previously been based on either nights or stays but never on number of different Marriott brands visited. The 2,000 bonus points for every stay starting from the second stay is a decent offer for those that have short and inexpensive stays. To maximize the bonus, one should have one night stays and switch hotels and brands, although not sure if the hassle is worth 2,000 points. I have no issues staying at JW Marriott, Marriott, Renaissance, Ritz-Carlton, Autograph Collection and Courtyard brands during the offer period for 20,000 bonus points (brand and stay bonuses). Depends where I end up traveling in August, AC and Moxy bands could perhaps be possibility too. © 2017 Marriott International, Inc.